Methane, a bi-product of landfill decomposition, is approximately 25 times more potent than carbon dioxide in regards to greenhouse gases. Given the emphasis on climate change and environmental sustainability, waste and resource recovery is an area that Wagga Wagga City Council takes very seriously and is proactively working towards minimising the waste we send to landfill. To reduce waste to landfill Council provides a 3 bin kerbside service, community education and state of the art recycling facilities. We are also researching new ways of diverting waste and developing strategies within various facets of the community including business, industry and development to minimise waste. It is imperative that households understand where their waste goes and ensure that they recycle correctly and look at ways to reduce their consumption of materials. Kerbside collection of domestic and commercial waste within specified collection areas. Waste management facilities, including landfills and transfer stations. Provision and servicing of street bins. Provision of Triple-R (Resource Recovery & Resale) facility at Gregadoo Waste Management Centre. Education and promotion relating to solid waste and recycling opportunities. Gregadoo Waste Management Centre is more than just a landfill. Items can be dropped at this facility for recycling and reuse. Ewaste - it is free to drop off unwanted computers, monitors and mobile phones. It is vital that we minimise the amount of waste that we send to landfill. The first thing we should think about when it comes to reducing waste is implementing the waste hierarchy which sets out priorities for dealing with waste. Avoid - Determine whether we need to generate a waste item in the first place. A good example is not taking a plastic bag from the shops and using a reusable shopping bag instead. Reduce - We need to reduce what we consume. Purchase products with minimal or no packaging or select products that have recyclable packaging. Reducing is all about smarter shopping and thinking about what you really need. Reuse - Lots of things can be used over and over. Glass jars can be used to hold bits and pieces, flyers for scrap paper, or take away containers as food storage. Reusable water bottles are another great example. Recycle - once you have avoided, reduced and reused, recycle everything that you can. 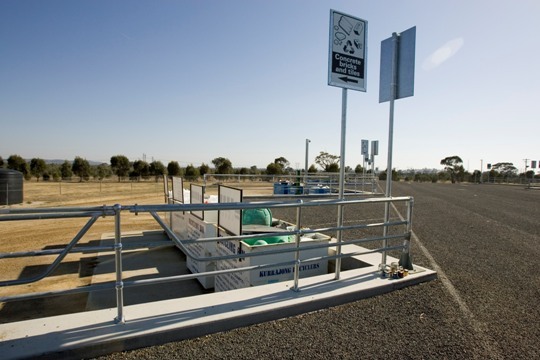 Wagga Wagga City Council operates a 3 bin system. This system assists households with reducing what they send to landfill. Find out more about what goes in each of your kerbside bins and where your rubbish ends up here. Council offers residents the opportunity to dispose of waste for free at the Gregadoo Waste Management Centre on two dates per year. These dates are advertised through Councils website and through local media. Items suitable for resale can be dropped off at the Gregadoo Waste Management Centre's resale facility. You should never dump your waste in parks, reserves or roadsides. It is now more likely that you will get caught through the Don't Dump, It's Dumb campaign. More than 50% of the average household bin is made up of food and garden waste. You can recycle your own organic waste at home and use the end product in your garden. Why buy compost when you can make your own? Learn about the options for organic recycling to see which one would suit you and your lifestyle. Worms are nature's recyclers and worm farms can be purchased from your local home and garden centre or you can build your own to start worm farming today. Your local home and garden centre will also stock worms to kick start your farm. Worm farms are perfect for unit dwellers or those with small gardens. The liquid by-product of the worm farm, when diluted, makes a great liquid fertiliser for your pot plants or garden. Anything that was once a plant can be composted. You can purchase a variety of compost bins from your local home and garden centre - or you can simply build one in your back yard. A compost heap can be as simple as a pile of organic material with a hessian cover. Compost bins or heaps are perfect for those with large backyards. Once the compost is mature - spread the material over your garden beds or sift your compost to use as a top dresser for your lawn. Bokashi buckets take almost any kind of kitchen waste. These buckets can be stored in the kitchen as they do not smell. This system works by adding Bokashi Effective Micro-organisms mixed with bran and sawdust to your food scraps. The Bokashi system utilises a fermentation process that allows the material to quickly breakdown. Once your bin is full you can either bury the scraps in your backyard or add the material to your compost bin until it completely decomposes.